Pictured at the first local working group meeting (from left) KSU president Steph Dalli, ICCSD researcher Carlos Canas, ICCSD director Prof. Maria Attard, Green Travel Plan coordinator Raphael Mizzi, Bumalift app representative Guillaume Pons, Transport Malta representative Patrick Cachia, David Alvarez from Malta Public Transport, Mike Rosner representing the University academic staff, Maronia Schembri representing the University administrative staff, Christopher Spiteri from the University Estate and Works office and Lino Bartolo from Msida local council. 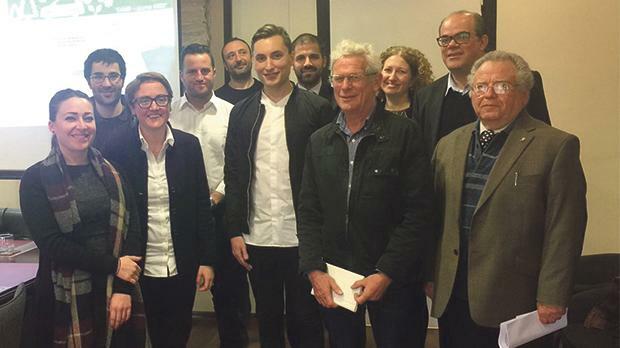 The University of Malta is involved in a project called Camp-sUmp aimed at promoting low-carbon strategies and energy efficiency while improving mobility in the Mediterranean area. One of the project objectives is to facilitate dialogue between users of transport services, particularly university students, and decision-makers, in order to design a plan for their mobility. The first phase has been implemented whereby the University and other partners involved in the project organised a meeting in their respective countries with representatives of local, regional and national public administrations, service operators, transport agencies, mobility managers, university staff and other stakeholders. During the meetings, questionnaires were distributed to identify critical issues and interviews were conducted to determine the actions that need to be taken to improve the current situation. After this phase dedicated to context study and analysis, the project partners, with the support of the transnational working group, will draw up a mobi­lity plan combining innovation and sustainability. The project leader is the Foundation Magna Graecia and other partners involved are the universities of Athens, Valencia, Cyprus, Split, Malta and Bologna. The project is co-funded by the European Regional Development Fund under the Interreg Med programme.